The first S-trains with double space for bikes are now up and running. S-train has introduced one-way traffic in the new bike compartments to make it easier and faster to get on and off. 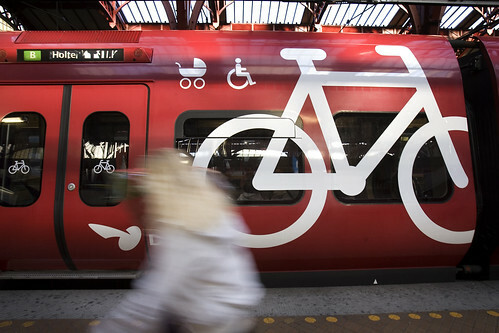 The Copenhageners love to cycle and to take their bikes on the S-train. In 2010, S-train made it free to bring the bike on board, which has been a growing success, so now S-train is remodelling 10 trains, making space for twice as many bikes. There will be one-way traffic in the new bike compartments, so you enter at one end and exit at the other. “In order to make it faster and easier for cyclists to get in and out of the S-train, we have decided to introduce one-way traffic. 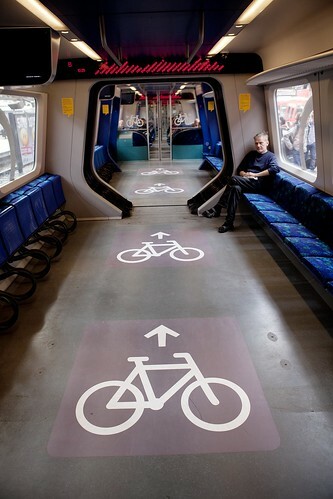 In addition, the new bike compartments have room for twice as many bikes as usual, and we can spread out the bikes along the platform because the new bike compartments are located in the middle of the S-train,” says Sales Director at S-train, Niklas Marschall. As the Copenhageners are a most bicycle-friendly lot, S-train is continuously working to improve the conditions for cyclists on the S-train. An analysis from April this year shows that a third of all passengers have taken advantage of the possibility of bringing their bike on the S-train for free, and 91% are very positive about the idea whether they take their bike on the S-train themselves or not. Moreover, it makes even more people choose an eco-friendly means of transport if they combine bike and train. A whole 27% of the cyclists state that they wouldn’t have taken the S-train if they couldn’t bring their bike for free. “We want to help make Copenhagen the world’s best city for cyclists and create even better conditions for cyclists. At the moment we are putting up bicycle pumps at a number of stations, making bicycle ramps, more bicycle parking facilities, and now also twice as much room for bikes on the S-trains,” says Niklas. The new bike compartments are located in the middle of the train. This takes the pressure off of the many passengers who prefer to use the doors at the ends of the train. The remodelled trains have pronounced coloured stripes on the sides of the train leading the way to the bike compartments. In connection with the introduction of the remodelled trains, S-train is also making an extra effort to draw attention to the existing bike compartments that are already located in the middle of the train, but which are not used much. Passengers bringing baby carriages on the S-train have the possibility of being in the passageway as well, while bikes are only allowed in the bike compartments. In 2010, the number of bikes on the S-train more than doubled which meant that almost 5 million cyclists brought their bike on board. S-train is currently remodelling 10 trains to make more room for bikes.